If you love the rich chocolate and fluffy cream in the first four layers, dig down and you’ll find four more luxurious layers underneath just waiting to be scooped up. Yum. Prepare cake batter and bake in 13x9-inch baking pan as directed on package. Cool completely on wire rack. Cut into 1/2-inch cubes. 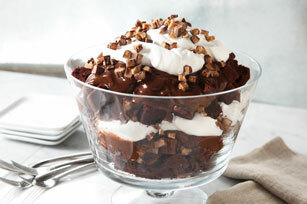 Layer half each of the cake cubes, pudding, whipped topping and crushed chocolate bar in large glass trifle bowl. Repeat all layers. Serve immediately or cover and refrigerate until ready to serve. Using fat-free pudding and light Cool Whip will save 34 calories and 1.7g fat per serving. To reduce fat and calories further, prepare cake using light or no-cholesterol package directions.